Agriculture is confronted with changing weather patterns. For farmers this implies higher risks related to crop growth and field work conditions. Adequate, timely and spatially differentiated measurements of soil moisture become more important for farmers to make decisions on if, when and how to irrigate. The project will focus on combatting water shortage at the farm scale and territory level by developing applicable service models for decision support in irrigation. Worldwide significant progress has been made to utilize precision irrigation as means to increase water use efficiency (more crop per drop) or decrease water foot print in irrigated agriculture. Overall this progress is restricted to application at field scale and integration precision irrigation in the planning of water resource use at territory scale is still a challenge. Point information, such as resulting from sensors, is still difficult to be transferred to a larger spatial unit. Remote sensing algorithms to estimate evapotranspiration are available but often not at sufficient resolution, and do not provide predictions on upcoming water use. More experience needs to be gained in combining technologies and scales: direct mapping of soil moisture as done with in-situ, air- or space borne radar, crop water stress mapping by thermal infrared sensors or derived from crop vigour and/or modelling of the crop/soil/atmosphere continuum. When adequately fused with terrestrial measurements these mapping tools offer decision support for agricultural water management. Up to now, acquiring data, analysis, fusion and modelling are yet merely scientific abstractions without a direct link to operational water management. OPERA aims to bring advances from remote sensing, soil moisture monitoring and forecasting rapidly towards implementation and commercialization. A series of case studies demanding precision irrigation, increased water use efficiency and resilience are used to research the practitioner needs, ways to increase the robustness of information supply, alternative cops, and concrete local barriers that had prevented the transfer of research results into the farmer and water manager practice. While water scarcity and the urgency to increase water use efficiency is the common nominator at all sites, the case studies will offer the access to different types of irrigation systems under different climatic conditions. 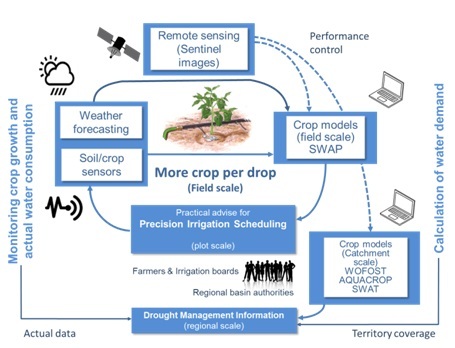 In contrary to technological driven research projects, OPERA will apply a transdisciplinary approach to identify jointly (i) the user demands of farmers, farmer associations, extension services as well as water management organization, (ii) best possible combinations of information technologies and (iii) innovative service models to realize a practical transition towards an increased use of precision irrigation in practice. In this way the project contributes to optimal watering strategies and water saving, increase of agricultural productivity (tuning water supply to demand) and farm competitiveness in the agricultural market, and contributes to the creation of “green” job opportunities and economic growth for the EU and the associated international countries. D3.1 Results of field measurements, weather forecast and simulation models that allow elaborating more precise irrigation scheduling based on actual conditions (month 24). D3.2 Draft version of practical guidance for optimal irrigation strategies for farmers, farmer associations, local policy makers (month 26). D3.3 Final version of practical guidance (month 28).